For all of you out there following the news about the FDA’s potential decision to ban trans fats I want to assure you – there will still be extra special doughnuts. How is this possible you ask? Certainly you are frying those sublime ringed wonders in a hydrogenated oil that simply reeks of trans fats. Right?! Well, no. I am instead using soy oil which is trans fat free and tastes just as delicious. How about the dough itself, there has to be shortening in that because they taste so amazing. Again, no. I only use, and I mean only, Cabot unsalted butter for all my doughs. So come by tomorrow for extra special doughnut day here at Umpleby’s. The flavors I’ll be running are chocolate mousse filling with chocolate ganache on top and raspberry mousse filling with chocolate ganache on top as well. 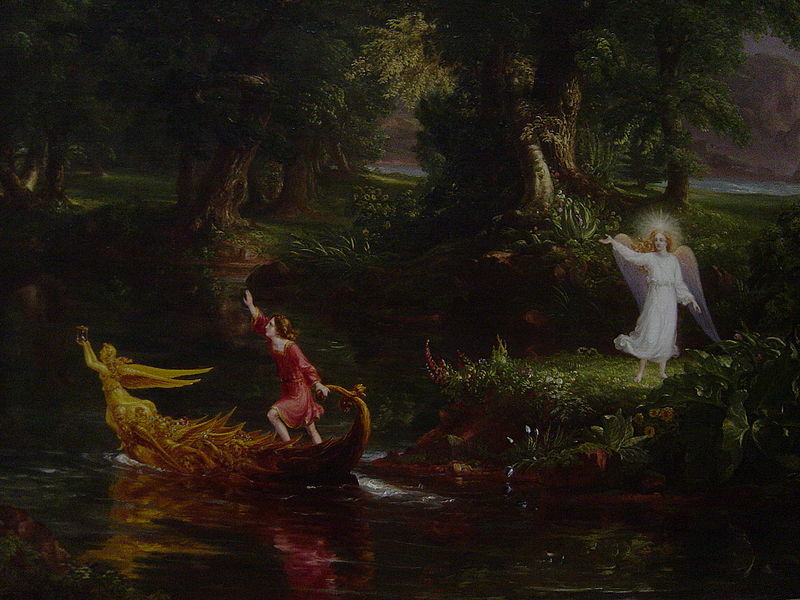 And in case you think I forgot to include a certain HRS of Painters artwork, I am attaching Thomas Cole’s The Voyage of Life, Youth.